The two categories to be discussed in this post include Games and Back Channels. Both allow for a wonderful formative experience. There are a number of resources that can be found on the internet in these two areas. The back channel in the classroom is powerful and your LMS (Learning Management System) may serve this quite well. You also may get some added privacy which is important. While I believe kids can create games as a awesome formative experience, I will save that for a later post. In this article I wish to focus on how educational games provide a wonderful learning experience perhaps going well beyond content. As in all online tools be sure to check your district AUP along with the terms and conditions of the website you are using. Enjoy the resources and please let me know what I should add for a future post! So many times I hear the idea of back channel and how it is a relatively new phenomenon. Back channel refers to the idea of a secondary discussion happening in the same environment as a primary presentation or demonstration. In reality the idea of back channel is really as old as formal education itself. Before the era of digital communication there have always been back channel discussions in the classroom whether it be spoken word, nonverbal gestures, or old fashion paper notes. In today’s classroom there is the possibility to use digital technology to allow, promote, and sanction secondary communication. A digital back channel allows students to have a conversation in the background during a presentation, lecture, video, or in the middle of a PBL activity. This back channel is actually a chat or forum provided by the teachers. The footprint left by a back channel allows for some wonderful insight as to how to meet needs of the group and individuals planning future instruction. The live interactions also allow for feedback and learning through the back channel process. Many times the LMS (Learning Management System) may have this built in, or you may wish to check one of the options below. It is important to teach and promote proper digital citizenship and also understand your district AUP (Acceptable Use Policy). Be sure to also read and understand the terms and privacy agreements for the tool you are using. A back channel can allow the formative learning and assessment essential for 21st century learners. Today’s Meet – Create a virtual chat room for students to collaborate and learn from each other. Explore ways to even make it private and save the conversations as transcripts that can be a valuable resource to teachers and students later. Chatzy – Encourage the chat in your room. Note how it actually can support the academic areas that are being addressed while providing student voice and choice. There are private and virtual rooms that also can be learned about. Backchannel Chat – Another wonderful tool that allows classroom back channels with so important teacher controls. Check out all the features as you encourage formative learning in the back channel. Google Docs – It is easy to use Google Docs as a back channel. Not only that, you may already have it deployed in your school. Not only does it have a chat feature to serve any of its apps on Drive, but the documents app can be used as a back channel by itself, allowing for an archive of discussion. A game is a wonderful formative learning tool. Kids enjoy a great game and accept the formative process of iterations that are a part of an engaging game. Working hard and even experiencing an occasional failure along the way provides the learning and an eventual win… or level up. Those bumps along the road can be interpreted as falling forward. Success is celebrated and the formative learning opportunities along the way make success possible. Some educators are embracing a classroom gaming culture to encourage learning. Students learn, earn badges, experience and overcome hurdles, and eventually obtain mastery as they soon enter a new level. Those educators not ready to turn the classroom into a gaming experience can still bring game ideas into the classroom. There is so much to be learned on a quest or conducting a simulation. There are resources that include already built games and simulations along with tools for teachers to build a game for their students. In fact, it might be amazing to turn students loose on some game building possiblilities using content standards in the foundation. The processes of designing, playing, and testing are formative experiences that have so much to teach. Below you will find some ideas that just might allow for some real neat formative learning… courtesy of a game or two. Utah Education Network – Are you looking for some interesting games and simulations that can fit into almost any subject area? Then check out these wonderful possibilities which are listed by subject category by the Utah Education Network. Jeopardy Labs – This game has always been fun whether it is analog on the television or cardboard as a game. Many teachers have even taken it digital using power point. If you are a fan you may wish to check out this Jeopardy digital site. Brain Rush – It doesn’t take long to see how this wonderful resource and its adaptive learning games will fit into your formative portfolio. Best of all, anyone can share, build, and try. Here is a chance for student s to become not just game consumers… but game producers. 3D Game Labs – It is time for educators to explore this 3D collection of over 20,000 quests. It is possible to venture into a multitude of subjects. Games can also be shared and even remixed. 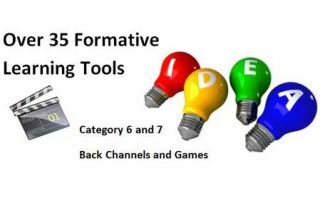 Think of the formative possibilities!